Please find another very practical example of a small but powerful geographical solution below. With this utility it is perfectly possible to get the distance or driving time between two locations and this based on the type of transport used (by car, by bike, on foot or by public transport). To optimize the user-friendliness of our commute analyzer, we decided to integrate this solution in Excel and, as a consequence, we do trigger Google queries from a Microsoft spreadsheet! The above high level diagram depicts as well the other potential scenario’s on how to interface. Addresses can be easily entered from a web-app or a Google spreadsheet. The main goal is to send the address or the longitude and latitude over the network to a cloud GIS like service and to parse the JSON or XML response to retrieve the distance and time. 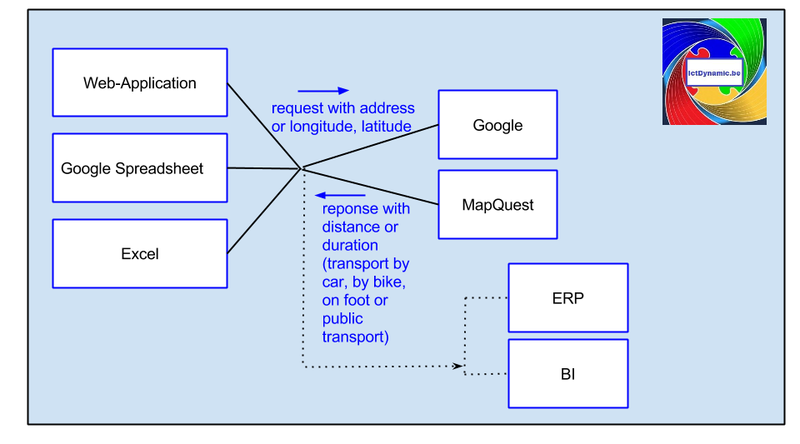 We opted to interface from Excel with Google but be aware other systems like MapQuest exist as well. If you would decide to choose for Excel, please be aware of following caveat. There are plenty of Excel versions on the market (tablet, Mac, smartphone) and not every version support macro’s. It’s possible Microsoft’s Office 365 and its Power Query will resolve this problem but we cannot confirm this yet. We tested the compatibility of Google Spreadsheet and are happy to confirm similar functionality works perfectly from a laptop, tablet or smartphone! As mentioned, the response contains the distance and the duration. At the moment, potential traffic jams are not included in the calculation of the duration but we hope to be able to deliver this functionality in a more enhanced version of this utility. Comments or suggestions? Don’t hesitate to inform us. We are pleased to confirm the next article will be covering some other GIS related functionality like optimizing routes, tracking services or the influence of nearby competitive branches on your own local branch (so called location analysis or location analytics) but please make suggestions as well to allow us to elaborate on your ideas. Keywords: calculation distances excel, mobi scan, mobility scan, calculation travel duration excel, commute analyzer, travel expenses, location analysis, location analytics. This entry was posted in English, Google and tagged Distance, English. Bookmark the permalink.